He shouldn’t be there, should he?. I stood in front of The Field Of The Cloth of Gold, marvelling. It is the sort of picture, my husband would say, that one should have in one’s toilet: endless detail to contemplate and re-contemplate, on which to speculate, to stare and stare and still see something new. But when one is cruising Hampton Court with a clutch of three endlessly inquisitive children one does not have that luxury. And the painting wouldn’t fit in the toilet anyway. Well, not mine. So I took my camera and I snapped and I snapped and I snapped, detail after detail so that I could blow up images when I got home and put them on the wall and think about them. But even standing there, this character jumped out at me. What was a dragon doing, flying above The Field? This was the famous meeting between Henry VIII and King Frances I of France, which took place in June 1520. As far as I knew, anything resembling a dragon had died out some time before. Ah, I thought, it is symbolism. The greatness of Henry, and so forth. Not according to the Royal Collection, the curators of Historic Royal Palace’s beautiful things. No: The dragon, they say, is a firework. It was released -or should I say, let off – on June 23rd, the day before the English packed up their bags and trundled back across the channel homewards. It was designed to hail the ceremonial mass said by arch-organiser Cardinal Wolsey. Friends have to think very carefully before they holiday together. How much more, then, should the English and French have carefully considered a couple of weeks just outside Guînes? It was a splendid event, sumptuous, with no expense spared to parade each country’s greatness. But the whole business had gone a bit sour. They jousted and wrestled, and on the occasions Henry lost he did not do so gracefully. But Wolsey was a stickler for detail, and the closing ceremony went ahead as planned. I didn’t know they even existed. I thought dragon fireworks were a fancy of JRR Tolkein’s, a whimsical manipulation of gunpowder conducted by his arch-wizard Gandalf. Who can forget the astonishment of the Shire dwellers at Bilbo’s eleventy-first birthday party when dragons swoop over their heads? It is an aspect of Gandalf”s character of which we see little: he is a magician first and foremost, but he has a little sideline in science and technology. There is no magic about the gunpowder dragons: just mastery of the art of painting with explosives. Gunpowder shapes have been around since the tenth century in China. But I always thought the Brits didn’t grasp it until the Arab nations learnt of it from China, and brought it across continents to Europe. My history books say fireworks came with the advent of chinoiserie – that fascination with all things Chinese which swept the continent in the mid-seventeenth century, resulting in a rash of Chinese-style ceramics and fabrics and stories. So: he shouldn’t be here in 1520, this firework dragon. Yet there he is, large as life. There are so many jigsaw pieces missing here. 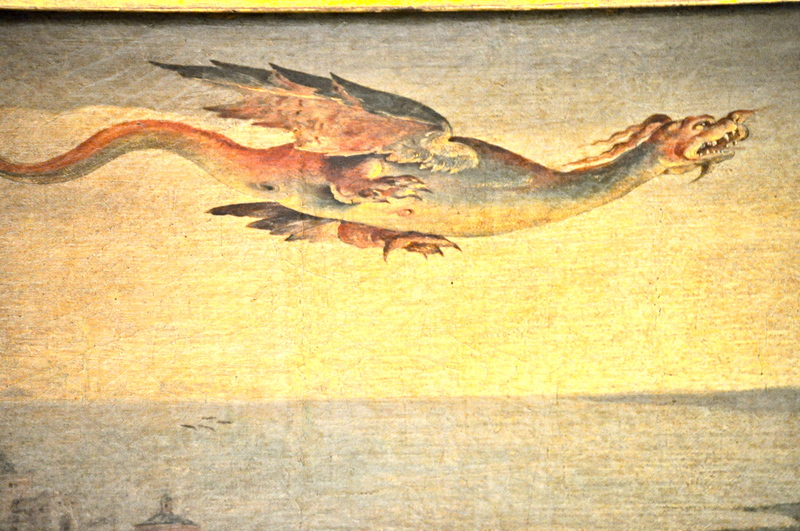 How did the dragon journey across the world, and into the expert hands of Cardinal Wolsey? As to whether a firework dragon is a possibility: look no further than the streets of Beijing, on January 23rd this year. 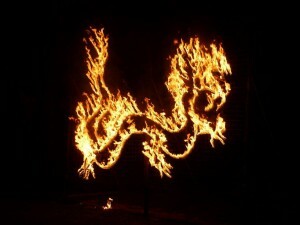 It is the year of the dragon: and to celebrate, the most spectacular firework was sent up in the sky. The most perfect Chinese dragon. Posted in Quirks of HistoryTagged dragon, fireworks, Henry VIII, The Field of the Cloth of Gold, The Royal CollectionBookmark the permalink. I wonder if there’s moving footage, Sidey? You could enjoy it even more then…. First time for me – the concept of a firework dragon. Looks fantastic. It’s seems unlikely that powers who held sway at the time would have allowed the artist too much licence, so it seems firework dragons had arrived sooner than expected. Oh, would to have the story of its procurement. Roger. Therein lies a novel. The dragon featured is definitely a Chinese dragon. Chinese dragons have 5 claws, Korean ones have 4 and Japanese dragons have 3. I am sure the curators are correct, however, Chinese dragons are traditionally symbols of power and strength, and that is why they were used by the Chinese Emperors. Dragons via Henry VIII and Bilbo Baggins. It doesn’t get any better than this, Kate. Sublime. Thanks, Tilly. There are stories wherever we look, aren’t there? 😀 Couldn’t put it better myself, Lou. You summed it up in style, Lou! Wonderful post! I’m clapping and smiling and glad. Okay, that’s mostly from Peter Pan, but this was fun to read and now I must find an old kiddie book, The Dragon in the Clock Box. Oooh! Can’t wait to hear about that one, Penny! Pingback: Weekend Roundup: October 7-13 « Neither Here nor There…. A dear Chinese-American friend of mine was hoping that her longtime bf would finally marry her this year, the year of the dragon. Apparently, this is a huge deal if you’re Chinese. In August, he finally proposed with a ring the size of Jupiter. The wedding is set for next June. I asked, “So what’s that, year-wise?” She said, “I dunno, I’m Chinese from New Jersey — probably the gnat.” But, she is very happy. I was about to ask how can a dragon look like a firework, then saw that photo of the dragon firework. I’m very impressed, Kate. Wow, that photo really shows what the Chinese can do with fireworks after several thousand years of working at it! I wonder if the one for Henry looked like that? I never knew real fireworks were involved in that meeting, Kate. Interesting. Here’s the Royal Collection take on it, Andra. I am wading through accounts of the time slowly. Hoping Hall’s Chronicle has references but just too pressed to sift right now…maybe at half term…. Our thoughts went down similar paths. I posted last night about a red dragonfly and you posted about a fiery dragon. I really enjoyed your post and the little bit of firework history. I also thought of The Lord of the Rings when I saw your title and was not surprised when you mentioned it :-). I never saw that fireworks dragon before, but it might be one of the coolest things I’ve ever seen. Now to see one in real life, Weebles…. You just can’t trust them, can you, Garbrielle? Bunch of charlatans. I don’t really know the symbolism behind the dragon, but no matter how they’re depicted I always take notice. We have a HUGE Chinese community in our city and dragons figure in prominently in art and ceremony. You have me thinking that I really should learn more here! I love the Field Of The Cloth Of Gold. It’s spectacular! It is a gorgeous painting. But huge in real life, Debra! I’ve read about the Field of The Cloth of Gold (due, in part, to my slight Anne Boleyn obsession), but I had no idea about the dragon. Fascinating! I always find the little details begin to hit you if you go to a place again and again, Bellejar…you notice things you never would have the first time. And the dragon is a case in point! A pity that dragons and unicorns never made it to Noah’s ark. Another delightful post, Kate. Fascinating. I wonder at that wonder, It certainly fires the imagination. He’s an incendiary soul, Col.
Another novel waiting to be written, and with a title already. Oh, for a thousand lifetimes to write this stuff…. Ah, Jack, this is one of the advantages of an internet where everything seems to be one huge archive of everything that has been written: I write this a long time ago but it remains one of my favourites 🙂 Thank you for reading, and good luck with your dissertation!